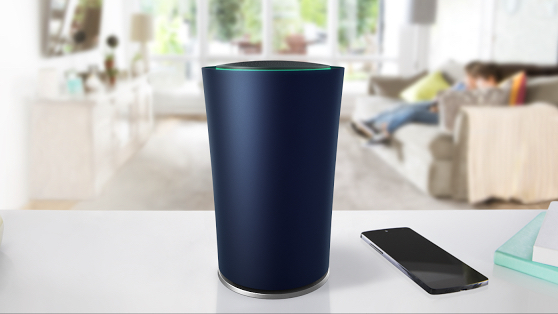 Google's new OnHub is aiming to be a reliable Wi-Fi router that's not so bad looking either. That's it. Designed to be as easy to use as Google products such as Chromecast, most of the interaction with OnHub takes place using the iOS and Android app - you can see your password, text or email it to friends, see how much bandwidth your devices are using and prioritise a device for, say, Netflix streaming. OnHub also automatically updates itself with new features and security upgrades. Read this: Brillo vs HomeKit - who will win the battle for your home? The stylish, cylindrical router, built in collaboration with Chinese company TP-Link, uses 13 Wi-Fi antennas in a circular design as well as software that auto adjusts OnHub to avoid network interference. It's now on sale for $200, admittedly a little pricey, in US and Canada. That's exciting enough, to be honest, for anyone who hates their router with a passion but it gets better. Google has also laid the foundations for Weave and Brillo integration as there's a ZigBee radio, in addition to Wi-Fi and Bluetooth, which uses Weave protocols. That means that the OnHub could be used as a smart home hub to control, for instance, Nest thermostats and devices via Weave and other third party, smart light bulbs, alarms and security cameras over Bluetooth and Wi-Fi. OnHub has a speaker which Google says is for setup but could, in theory, be used with Google Now in the style of Amazon's Echo connected speaker and its personal assistant Alexa. This is the first OnHub product but Google says it will work with partners, such as Asus, to design new devices in the future. Essentially, this could be it. Sure, it's quite expensive but even so, OnHub could be the device that puts Google at the centre of our smart home experiences.